Central Union Church Preschool & Kindergarten kids, ranging from ages 2 to 6, ran through fitness and fun exercise drills yesterday in the second annual Super Star Fitness Fun Walk. 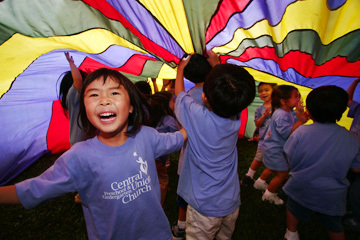 Katelyn Pabila, 4, was among those having fun under a giant tarp. About 150 people marched on the state Capitol last night as part of Homeless Awareness Week, which was capped off with a candlelight vigil. The event was sponsored by Partners in Care, a coalition of 60 organizations that works to better the lot of the homeless. 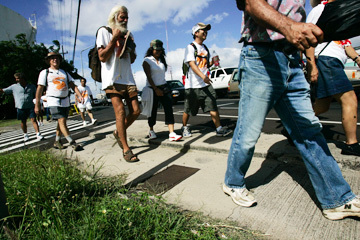 Participants in the 130-mile, around-the-island walk to raise public awareness about homelessness made their way yesterday along Nimitz Highway. "Walk the Talk: Shelter the People" took place in intervals beginning on Nov. 8. 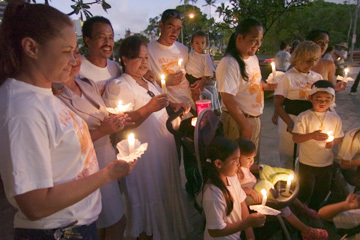 Participants made stops at parks around the island to hear the stories of people who live there. 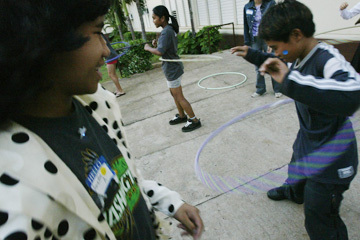 Washington eighth-grader Anette Aga, left, in "hippie" get-up, tried to distract sixth-grader Gavin Shimabukuro-Kaimi during the hula hoop contest at last night's "Blast to the Past" festivities at Washington Middle School. The event included other games, food, dance contests and screening of classic films.